Whether you want to restore and preserve that venerable but neglected old apple specimen, or establish a well planned back yard orchard of early bearing, disease resistant trees, we’re here to help. Customized pruning of older trees can improve their productivity, emphasizes their beauty and helps ensure their longevity. Properly planted and well-tended-to younger trees will inevitably provide you with a bigger basket of bounty than will improperly planted and poorly-tended-to trees. Call us for an educational consultation to help you do it yourself, to discuss a reasonable service plan, or to get that nice little orchard started. 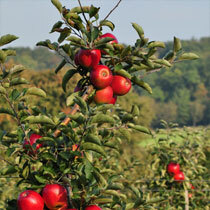 Fruit trees reward you for a life time! There’s nothing better on a cool Fall day than reaching up into your own favorite apple tree and picking a ripe beauty that’s hanging there in the sun. Then take that first crisp, juicy bite. Life is good!